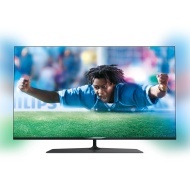 alaTest has collected and analyzed 135 reviews of Philips 55PUS7809 Series. The average rating for this product is 3.8/5, compared to an average rating of 4.3/5 for other products in the same category for all reviews. We analyzed user and expert ratings, product age and more factors. Compared to other products in the same category the Philips 55PUS7809 Series is awarded an overall alaScore™ of 90/100 = Excellent quality. alaTest has collected and analyzed 2 user reviews of Philips 55PUS7809 Series from Amazon.co.uk. The average user rating for this product is 3.5/5, compared to an average user rating of 4.3/5 for other products in the same category on Amazon.co.uk. The Philips 55PUS7809 is a mixed bag. For the money, we’re happy with the screen size and the picture performance. Just wish they did a larger version. Side lights really add to viewing experience. Excellent tv, absolutely delighted with it as it looks lovely, has great picture quality and sound. Would definitely recommend it.